At this year's Wanted Design show during New York Design Week 12 contemporary designers unveiled 12 fresh new designs made entirely of lumber reclaimed from blighted New York City buildings! 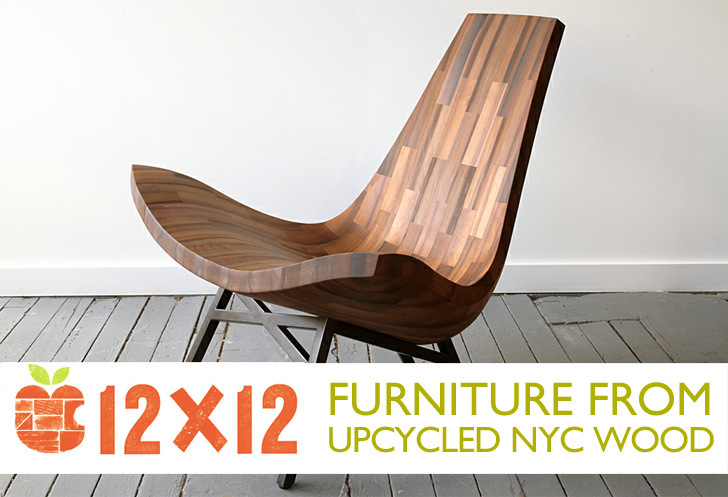 Dubbed 12 x 12, the exhibition features a chair made from a Park Avenue water tank, a desk made of wood salvaged from the Brooklyn Bridge, a coffee table made from Coney Island boardwalk planks, and a bar cart made of old wood casks from a distillery in Flushing. Read on to check out our photos and learn more about all 12 designs from this inspiring show! Bellboy used pieces of wood salvaged from a Park Avenue water tower to build a beautifully sculpted chair. Louis Lim‘s Round & Round bench doubles as a circular storage unit! When closed the drawer fits flush to the bench’s truncated edges – pull the shelf forward to complete the circle and access the interior. Design Brigade showcased a beautiful ‘Low Table’ made from Coney Island boardwalk planks. The table beautifully exhibits the weathered texture of the wooden planks that compose it, and it features slots for storing books, magazines, and other media. Uhuru unveiled a beautifully finished dining table made of black spruce wood salvaged from the Henry David Throeau School. Nicholai Moderbacher created a fun see saw out of a massive reclaimed timber. The see-saw hinges upon a pivot attached to a platform made from reclaimed wood. Carlos Little reclaimed structural lumber from the former site of the American Express stables to create this quirky table, which bears a hidden secret – a carved wooden gun is magnetically attached to the underside of the desk! Tri-Lox‘s drafting table is made from wood salvaged from the Brooklyn Bridge. A matching stool rounds out the design – we love the contrasting texture between the silvered wood top and the natural wood legs. Fiyel Levent assembled her Vice Box bar using red spruce reclaimed from a 1920’s dance hall and theater. The side of the box is laser-etched with beautiful circular motifs. Karl Zahn‘s set of “Untitled” chests are made of reclaimed heart pinae wood from the future site of the Atlantic yards development. Fort Makers created this Stock Bar from a fitting material – wood casks salvaged from a distillery in Flushing! Daskam Dworkis and Emily A. Martinez unveiled a beautiful shelving system made entirely from reclaimed wood. Cool chair. Elegant and durable. It uses more material than needed, and it looks heavy. But I bet the sculpted, salvaged wood would be hard to re-salvage at the end of the chair's life, so it's important to maximize its life by making it freakin tough. Louis Lim's Round & Round bench doubles as a circular storage unit! When closed the drawer fits flush to the bench's truncated edges - pull the shelf forward to complete the circle and access the interior. Design Brigade showcased a beautiful 'Low Table' made from Cony Island boardwalk planks. The table exhibits the weathered texture of the wooden planks that compose it, and it features slots for storing books, magazines, and other media. Carlos Little reclaimed structural lumber from the former site of the American Express stables to create this quirky table, which bears a hidden secret. A carved wooden gun is magnetically attached to the underside of the desk! Tri-Lox's drafting table is made from wood salvaged from the Brooklyn Bridge. A matching stool rounds out the design - we love the contrasting texture between the silvered wood top and the natural wood legs. Fiyel Levent assembled her Vice Box bar using red spruce reclaimed from a 1920's dance hall and theater. The side of the box is laser-etched with beautiful circular motifs. Karl Zahn's set of "Untitled" chests are made of reclaimed heart pinae wood from the future site of the Atlantic yards development. Fort Makers created this Stock Bar from a fitting material - wood casks salvaged from a distillery in Flushing!